If fishing seems to be an attractive option for you, but you lack the patience, the equipment and a boat, then we have an awesome alternative to satisfy your hunger with and that is Fishing Diary. So go ahead and catch some of the most exotic fish or even a shark with just a click. 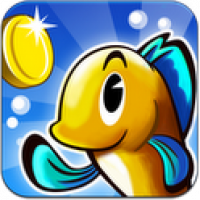 Created by DroidHen, the developer has served an array of wonderful games before and with Fishing Diary they have lived up to the tradition of being one-of-the best. The game is very straightforward and there are no hassles involved in getting through the menu. Things are simple from the word Go. On firing up the app, a very pleasant wave sounds are heard and then an anchor falls in, putting you in the mood for some serious fishing. As the name suggests, the game maintains a daily diary and notes down about the type of fish caught and the number of fishes caught to track progress. The progress report can then be shared via Facebook, DLNA, Picture editing apps, Email, Twitter and many more sources, depending on the handset. The game features 9 various cannons that shoot nets at different speeds and has its own extra power. such as a bomb for catching all the fish in an area, food for gathering the fish in a spot and capturing them, and electrocution, by which all of our little friends in a certain area get electrocuted. The game also features mermaids and on capturing them, you get hidden treasures in form of mini-games. Fishing Diary is a very interesting game and really will keep players hooked for a while. Overall, very well developed and highly playable. A 4.5 out of 5.